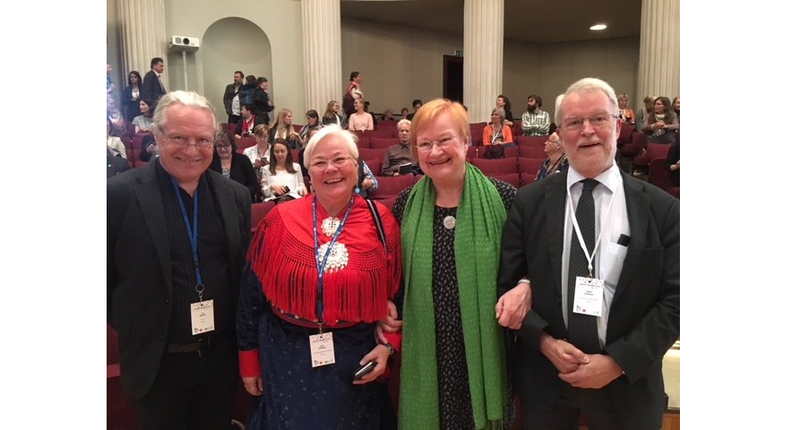 Picture: Lars Kullerud, President of UArctic (left), Liisa Holmberg, Chair of the UArctic Council, president Tarja Halonen, Aleksi Härkönen Ambassador, Arctic Affairs. Photographer: René Söderman. University of Arctic World Congress gathered together over 530 participants to its host cities Oulu and Helsinki. At the congress closing event 7.9.2018 president Halonen gave a speech in which she focused on gender equality in the arctic. President also participated in panel discussion about climate chance and the arctic. Congress was a part of Finland’s Chairmanship of the Arctic Council program and its main themes were similar to Finland’s Chairmanship priorities such as sustainable development, supporting the work for gender quality and United Nations Framework Convention on Climate Change and Paris Agreement. More information about the congress can be found from the congress website and also from the website of University of Oulu. Selected parts of the speech can be read here.